You may not know this, but if you see a purple pipe, it indicates that the water inside is recycled or reclaimed water! Reclaiming water is a great way to promote conservation, and also to reduce the overuse of potable (drinkable) water. Water gets used for all sorts of things at UConn – irrigation, flushing toilets, industrial uses, cooling, heating, and (most importantly in this hot weather) air conditioning! None of those uses actually require potable water – just water. At UConn, we actually have a Central Utility Plant (the CUP) which provides cogeneration, heating, cooling, fire protection and emergency electrical backup power to the campus. Today we had an event to celebrate the opening of UConn’s Reclaimed Water Facility, which in the summer, provides water primarily for cooling to the CUP. Today, all of the water necessary for cooling has been provided to the CUP, and all of the energy needed on campus so far today has been provided by the CUP! In order to recycle water, storm water and waste water are collected, filtered and cleaned, and then piped to the CUP. 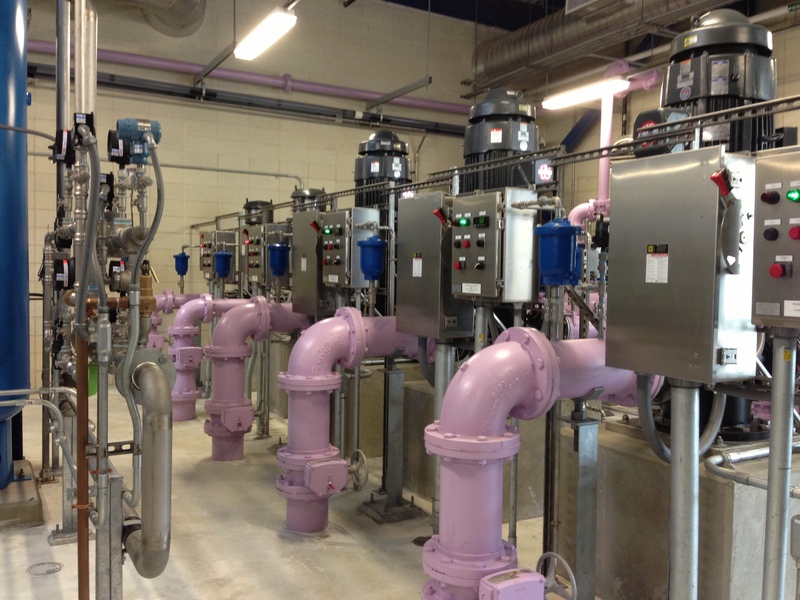 Right now, water for cooling is the primary use for reclaimed water at UConn, but there is the possibility for duel piping in new buildings to use reclaimed water for toilets, and permits are currently under review to allow us to use reclaimed water for irrigation. In the winter, the reclaimed water will continue to be used for the lower cooling needs of the university, as well as to provide water for the boilers to produce steam to heat the university. After the water is used at the CUP, it then flows back to the reclaimed water facility to be filtered, cleaned, and used again. Reclaiming water is an important step towards environmental sustainability, even in a relatively water-rich region. Reusing waste water (or grey water), or reclaiming water is critical for basic health and survival in many water-poor regions of the world where there is not enough potable water to use it for sanitation, irrigation, or industrial uses, as well as for drinking water. In the developing world – where 800 million people lack access to clean water and 2.5 billion people lack access to proper sanitation – infrastructure can be designed and built to support reclaimed water, rather than adding it after the fact. As part of UConn’s commitment to sustainability and to human rights, I hope that the reach of our reclaimed water facility goes beyond just reducing our water use, but helps provide an example of responsible and sustainable water use for others across the globe. Finally, the person behind the screen is revealed! I’m Corinne, the new sustainability coordinator at the Office of Environmental Policy. I started working at the OEP in May, and I hit the ground running, starting the planning for several fall events and working on a retro-commissioning data project. I am currently a Ph.D. candidate in the department of Political Science and I’m working on the Human Rights Certificate program. I am currently writing my dissertation on the institutionalization of the human right to water. I am particularly interested in the topic of environmental human rights, which is one of the reasons I am so excited to be working at the OEP. I started studying the right to water when I realized that water was not one of the listed human rights in any of the core human rights treaties. Water has since gained greater acceptance as a human right in the last few years, but it is far from fully institutionalized. My work attempts to bring together different types of water practitioners and human rights activists working toward the goal of improved access to water. I was invited to be a participant in the 22nd Academic Council on the United Nations System and the American Society of International Law Summer Workshop on International Organization Studies, which was on the topic of Water, Environment, and Health in 2012. I’ve previously taught classes on South Asia (my regional specialization) and Non-Western Politics for the Political Science department, and I’ve also worked as an undergraduate advisor for the department. I am the lead research assistant for Dr. Shareen Hertel’s Right to Food in India project, which started in 2011, and have been a research assistant and coding trainer for the CIRI Human Rights Data Project since 2011 as well. Right now I am balancing my OEP duties with orientation advising for the College of Liberal Arts and Sciences and working on the CIRI data. I graduated from Bowling Green State University in Ohio in 2008 with a B.A. in Political Science and English, and from University of Connecticut in 2010 with a M.A. in Political Science. At the OEP, I’m taking over from the wonderful Jen Clinton and will be coordinating the many projects that our excellent interns run. I am also working on a “Green Office” certification program for the various offices on campus. I’m having a great time working with Meredith (our only intern in the office right now), and can’t wait to meet the rest of our interns at the end of the summer!